Understand the nuances of the different views. iTunes 12 offers several ways to view your content: your music, movies, TV shows, and more. Each of these views presents content in a different way and displays different information about it. While many of these views are similar to what iTunes 11 offered, there are some changes. 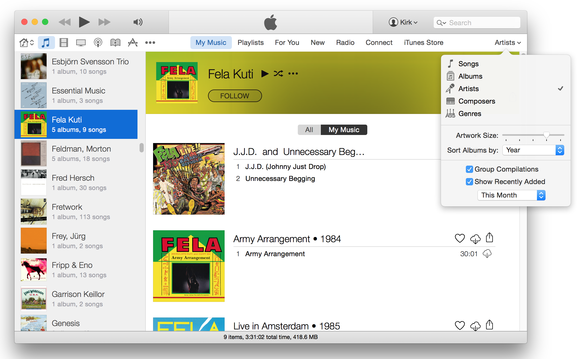 To change views, you click the View Options menu at the top right of the iTunes window—or press Command-J—to display a pop-over. The pop-over displays the name of the current view: for music, this could be Songs, Albums, Artists, Composers, or Genres. 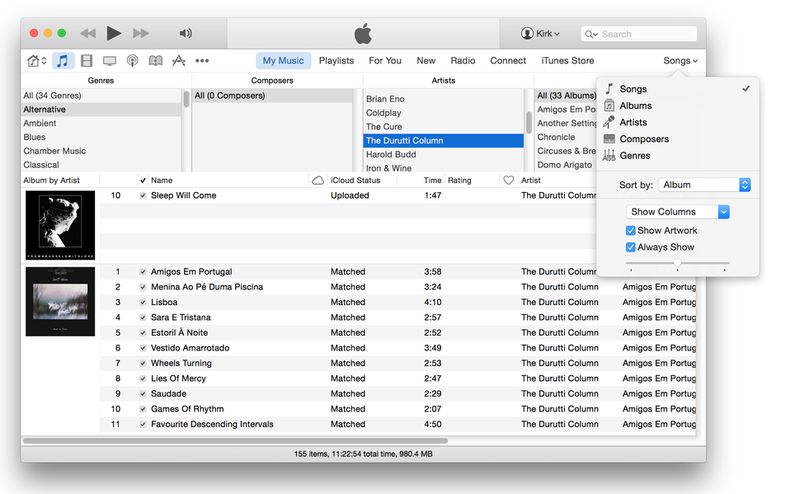 Note that if the iTunes window is too small, you’ll only see a down-pointing caret in its place. Here’s a look at the various views in iTunes 12. 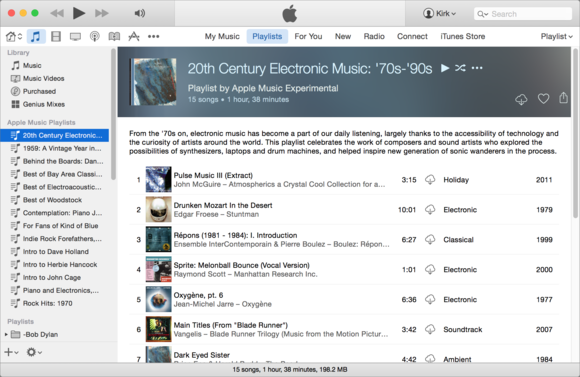 I’ll show examples of viewing music in iTunes 12, but most of the other types of content, with the exception of podcasts and apps, offer similar views. This is the simplest view and it shows one song per line. The main advantage of this view is the ability to display any columns you want with information from your media files’ tags. To do so, press Command-J, click Show Columns, and check the columns you want to display. 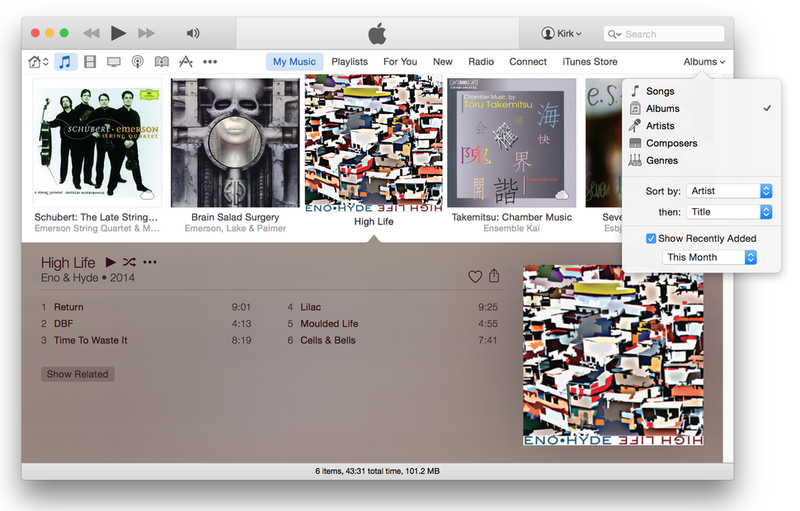 You can also choose to display album artwork, and choose its size from the View Options menu. You can make Songs view a bit more useful if you turn on the Column Browser; to do this, choose View > Column Browser > Show Column Browser, or press Command-B. The screenshot below shows Songs view with the column browser visible, and with album artwork displayed at the left. I’ve also selected the View Options pop-over. Songs view, tweaked to show the Column Browser and album artwork. Albums view displays your albums in a grid, with the name of the album and artist below each one. You can change the sort order in Albums view; press Command-J to display the View Options pop-over, where you can choose from two levels of sort criteria. For example, you can choose to sort your content by Artist and then Title. Albums view display your album artwork in a grid. You can also display recently added albums at the top of this view; the View Options pop-over lets you choose to display music you’ve added this month, in the last three or six months, or in the past year. When in Albums view, an Expanded Album view lets you see what’s inside an album and then start playing items or otherwise work with them. (This view works with movies and TV shows too.) Click an album’s artwork and you’ll see its contents displayed in a color scheme that iTunes bases on the dominant colors in the artwork. You can turn this option off if you wish. Choose iTunes > Preferences, click the General tab, and in the Views section, uncheck Use custom colors for open albums, movies, etc. These three views are all similar. When you choose one of them, you’ll see a sidebar at the left of the iTunes window showing a list of either artists, composers, or genres. 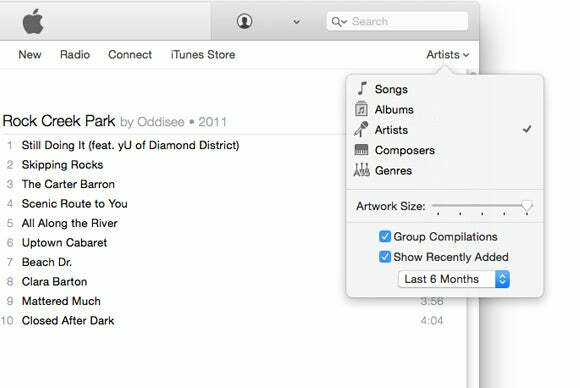 For artists, iTunes uses album art in your library to illustrate the entries; for genres, it uses built-in icons for standard genres; but if you have custom genres, it uses art from one album of that genre. For composers, it only displays names. Here’s Artists view for Fela Kuti. You have various sort options in these views. You can press Command-J and choose to sort by Title, Genre, Artist, Year, or Rating. With each of these views, you can change the size of the artwork via a slider; and in Artists view, you can choose to group compilations, so you don’t have the tracks of compilation albums scattered throughout the list. Note the presence of All and My Music buttons at the top of each artist’s music list. These take you respectively to the iTunes Store or Apple Music (All), or to the music that’s in your library (My Music). If you’re viewing a playlist—click Playlists in the navigation bar near the top of the iTunes window—you can use any of the above views, or you can use the new Playlist view. This view tries to display more information in a compact manner. Here’s an Apple Music playlist I added to my music library, showing in Playlist view. While Songs view lets you see more songs vertically, Playlist view offers more information. It shows a thumbnail of the album artwork, followed by the track title, artist, and album on two lines. It also shows the time, genre, and year, as well as a cloud icon if the tracks aren’t on your computer. Playlist view also has a colorful header, and, if you’ve added Apple Music playlists, contains the editorial description of that playlist. You have lots of choices as to how you display content in iTunes. You may find want to use a different view at different times, depending on how you’re browsing your library. Remember, changing these views is just a keystroke away (Command-J).